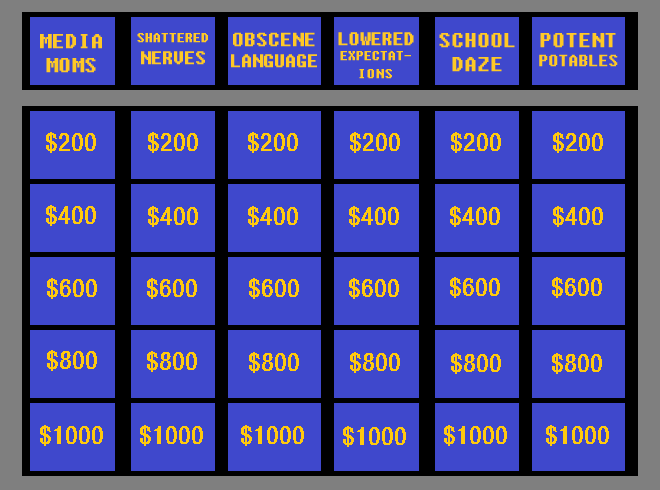 “Jeopardy game board” by SethAllen623 – Own work. Modifications made by the Imperfect Parent. Alex: Welcome to the special “Tournament of Moms” on Jeopardy this week. Well, at least we hope it can run all week . . . we didn’t find too many Moms who had any brain cells left, and of those who did, only a few could find someone to watch the kids for a few days. But we do have three moms here today. Let’s meet them. Alex: Our first contestant is a mother of two from International Falls, Minnesota: Jenny Creamale. Our second is a mother of eight from Ho-Ho-Kus, New Jersey: Rhythm Method. And our returning champion is a mother of two-year-old triplets from Eureka, California, with a two-day total of $35,000 – which should be just enough to pay for the babysitter’s upcoming stay at the Betty Ford clinic – Harried N. Frazzled. Let’s take a look at tonight’s categories. And they are: Media Mom, School Daze, Shattered Nerves, Obscene Language, Lowered Expectations, and Potent Potables. Harried: I’ll take Media Mom for $100, Alex. Harried: What is one of the first examples of meddling, unhelpful public service ads geared towards parents, Alex. Harried: Media Mom for $200, please. Jenny: What is iGuilt, Alex? Alex: You got it! You have control of the board, Jenny. Jenny: I’ll take Potent Potables for $100, Alex. Jenny: What is her own breast milk. Alex: So I’ve heard. Where to next? Jenny: Back to Media Mom for $300, Alex. Harried: What is monitoring the Internet and filtering content and television parental control v-chips and all that. Harried: Let’s try Obscene Language for $100. Alex: That’s the answer, Harried. Alex: Sorry, too late. Go ahead, Jenny…? Jenny: What is what you said when you found out that cold medicine is no longer recommended for young children. Jenny: Obscene Language for $200. Harried: What is what you said when your son told you his school play that you knew nothing about starts in 45 minutes and that he needs to wear black dress shoes and bring two dozen cupcakes for the cast party. Harried: Let’s go to Lowered Expectations for $100. Jenny: What is the length of time before you stop using the Diaper Genie and just start throwing the diapers into the regular trash. Jenny: Let’s go with Shattered Nerves for $100. Alex: Oh, it’s the first we’ve heard from you, Rhythm! Judges, can we accept “What is silent, wide-eyed twitching?” We can? Okay. Rhythm, that’s correct, and you have control of the board. Alex: I think Rhythm’s trying to say, Shattered Nerves for $200. And the answer is: WHOOP WHOOP WHOOP WHOOP! It’s a Daily Double! Hey! You don’t have to jump through the ceiling like that, Rhythm, it’s just our Daily Double alarm sound effect, Don’t worry, I promise your eight children don’t know you’re here . . . OK, you have $100. How much are you going to risk in the category Shattered Nerves? Alex: I’m sorry, we need that in the form of a question. Alex: Okay, we’ll accept that. You still have control of the board, Rhythm. Alex: Judges, can we accept fainting? We can’t? I’m sorry, Rhythm. You rang in, Jenny? 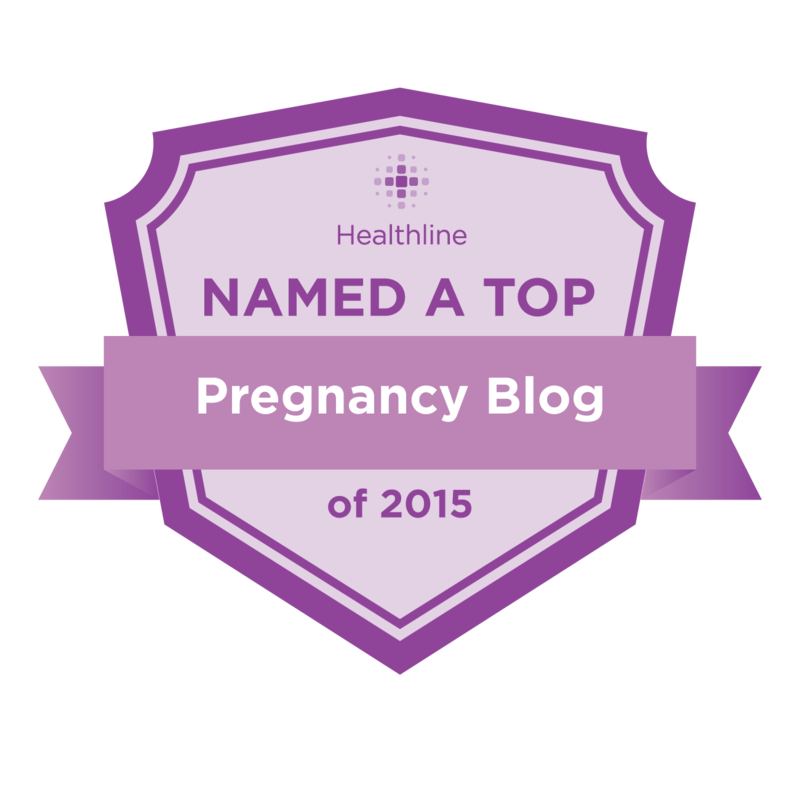 Jenny: What’s the last thing you want to hear during the routine yearly checkup with your OB/GYN. Jenny: Let’s go to School Daze for $100, Alex. Jenny: What is a low-grade fever? Alex: Hmm . . . be more specific, please . . .
Jenny: What is a low-grade fever that isn’t high enough for the school nurse to yell at you for sending your child into school with. Alex: That sound means it’s time for Final Jeopardy. Tonight’s category is . . . PLING! . . . Mom Math. How much will our contestants wager? Let’s take a commercial break and then we’ll see. Alex: Okay, let’s see what our contestants said to the response “Jack Squat.” Harried, you had $600 coming into Final Jeopardy. What did you write down? What are the chances of the T-ball game being cancelled this evening? Yes, that’s correct. What did you wager? $400, leaving you with an even $1000. Now let’s go over to Jenny. Jenny, you had $900. And you wrote down in response to the clue “Jack Squat” . . . How many IQ points do babies gain by watching Baby Mozart DVD’s? That is also correct! We would have also accepted: What is the amount of good a Upromise account will really do when it comes to paying for college … What is the number of articles about getting your baby to sleep through the night that are truly helpful … and how many manufacturers of jeans make a product that fits and still hides your muffin top? You wagered $900 – all of it! That leaves you with a grand total of $1800. Jenny Creamale, YOU are our new Jeopardy champion! Jenny: I suppose I have to say I’m going to Disney World, right? Goddammit … goddammit …. I read this article and found it very interesting, thought it might be something for you. The article is called The Tournament of Moms: A Jeopardy Game Show Parody and is located at http://www.imperfectparent.com/articles/the-tournament-of-moms-a-jeopardy-game-show-parody/.